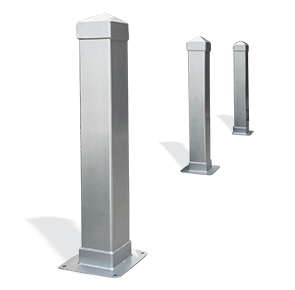 Traditional styling of the Dover Series Steel Bollards offer smart visual appeal and sturdy deterrence that helps regulate traffic flow—ensuring greater onsite safety and security. Engineered for exceptional strength and longevity, all-steel construction with an ultra-resilient powder-coating finish that prevents wear and corrosion. Available in a popular selection of color options, these versatile 3' and 4' bollards are ready to complement a wide range of architectural and landscapes designs.